Patek Philippe Children Charity Action: Auction records!On 11 June was held in Geneva the charity auction to benefit the Children Action. On 11 June was held in Geneva the charity auction to benefit the Children Action. 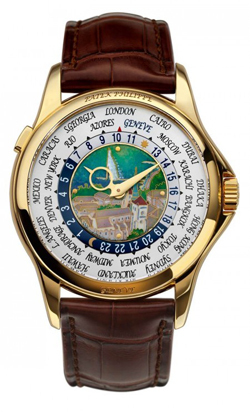 For the occasion, Patek Philippe has produced a unique piece, the reference 5131J, a World Time clock in yellow gold with cloisonne enamel dial depicting the Lake of Geneva. The clock has been beaten to a record 1 million Swiss Francs. The new record at auction than twice the figure achieved by the previous single original Patek Philippe watch created for Children Action in 2009, the Ref 5180T titanium, sold for 520,000 Swiss francs. The reference 5131J “View of the City of Geneva” in the central sector of the dial shows the landscape of Lake Geneva made by hand with the technique known as cloisonne. The term derives from “cloison” – which means the cell – in the watch is a glazing technique that is performed by applying a mixture of enamel opaque, transparent or translucent material within cells bounded by wire and made of precious metals like gold. In this example the time zone traditionally attributed to Paris, was replaced with Geneva indicated in blue. The clock with its exclusive identity of Geneva was purchased by a customer particularly fond of the Swiss capital. Founded in February 1994, Children Action is a charitable foundation that provides practical help to children in Switzerland and elsewhere, in areas such as medical and surgical care, counseling.